Not so very long ago we were in the midst of an iceage. About 15,000 years back, Idaho and Washington saw a cycle of huge, instantaneous floods that wiped vast areas clean of vegetation, and even moved the rocks in the canyon walls. If you start the tour at Missoula, Montana, and head west on US-93 and then Mont-200 you would be driving through an area that was underwater from time to time. It’s a pretty drive to Clark Fork where it all started. A wedge of the Continental glacier exported from Canada pushed across the Clark Fork River filling the canyon and creating an ice dam that raised water up to 2,000 feet deep forming Glacial Lake Missoula. At Missoula you can look up at the hills and make out the erosional wave effects of the ancient lake. have made a nice long recreational lake but it did have one problem. The dam leaked. After all it was made of ice, and water percolated through pores in the ice. Then at some instantaneous, calamitous moment, the ice lifted and the dam disintegrated, and a wall of water 2000 feet tall went roaring down the valley. 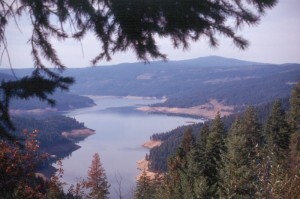 Much of the scenery from here westward illustrates the damage caused by the rampaging water. Soil was stripped from the land leaving bare surfaces exposed. Loose rock on the cliff walls was carried by the flood and transported to far off locations. It has been calculated that the flow of this river equalled that of the Amazon River for a short time. Once the flood exited the narrow confines of the mountains it spread out to 100 miles wide in a wave that swept everything ahead of it. This was the Spokane Flood, one of the west’s great geologic events that wasn’t volcanic. Much farther downstream we encounter the Columbia River which had carved a gorge known as the Grand Coulee. When the Spokane Flood washed through, the Grand Coulee became even more grand. 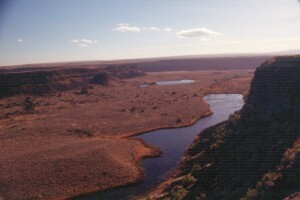 There are several Coulees in the region and they were likely formed by water running across a resistant layer and cutting into softer underlying rock. As the rock was washed away the upper resistant layer broke and fell, and the new canyon got longer. The same process is occurring at Niagara Falls. 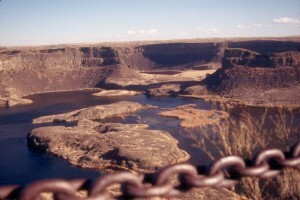 One of these former falls is Dry Falls, a falls that would have dwarfed anything we now know about. It had a lip three miles across, and was 400 feet high. So spectacular! The gorge is also dry, except for water leaking down through the rock from storage lakes above the old falls. Picture this coulee brim full of fast moving water. 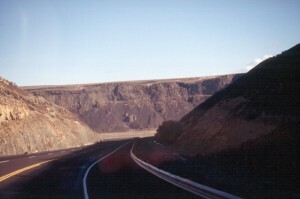 One hundred and fifteen miles southeast is Wallula Gap, caused by shoulders of the mountains coming almost together. The widely spread out water of the Spokane Flood had to funnel through the gap in a great surge. Water backed up into nearby canyons, and at Clarkston, on the Snake River, it backed up until it was over 600 feet deep. One of the exciting things about this flood is that it repeated itself about 40 times, as ice dams formed, and disintegrated. All the floods were not to the same depth, and you can see wave action and beaches along the cliffs in places where the water ponded for a time. If you drive near Camas Hot Springs, Montana, you will see a very unusual feature. You’ve seen ripple marks in the sand on a beach, but here you can see ripple marks that are 30 feet high, 200 feet apart and two miles long. These are immense ripple marks. Good views along the way. The scenery as you follow the Spokane Flood route varies from good to dull, but it’s worth the trip just to peer into the results of the historic floods. This material was extracted from my Scenic Driving Tours Book, “The Lure of Pine and Sage”.